A few days ago I had bought and tried out the thicker versions of watercolor paper for the first time, I was surprised with how an upgrade in paper thickness has significantly helped with the painting process. 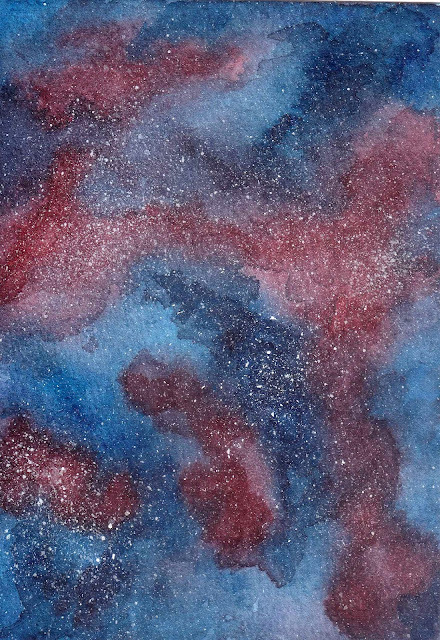 I attempted creating a galaxy painting on my 180gsm paper before but resulted in frustration: the paper was not designed to absorb that much water. The paper surface became feathered with brush strokes, but most importantly the finished product is crinkled like a crisp, and unlike the yummy snack, crinkled paper painting is not ideal. I noticed the thicker paper has helped greatly with absorbing the watercolor properly, and I reckon the coarser surface texture would have helped as well. This allowed me to go back on the previously wetted surface to build on pigments, without damaging the paper itself. This perhaps would be a very apparent and basic knowledge to art students, but for me, it is a gleeful discovery. I regretted not trying them before. Yes, it is more expensive, but the increase in cost to make them does make a difference. The other novel thing for me is that the watercolor pad has the four side sealed to prevent paper wrinkling. I have always use the taping method and it can get time-consuming to prepare and remove them. I am really glad that my new watercolor pad has this feature which has saved me a lot of trouble. Now on to my galaxy painting skills, I think areas I can improve on are, first, research for how to create a brighter colorful area for the nebulas. I am generally satisfied with the range of blue colors in both of my exercises, I feel both hues and the transition to lighter and darker areas are believable. The red and darker green areas in the two paintings respectively, looked too dull when it should have been vibrant. I don't know how to create a sharper pink color without using opaque white paints so this will be something I have to find out. For the green, I could have used more viridian hue, especially in the center area of the painting. Instead, I have added green calligraphy ink, which has even dulled the color more. If I could stick to colors similar to the left bottom corner of the green galaxy painting, I think it will look much prettier. 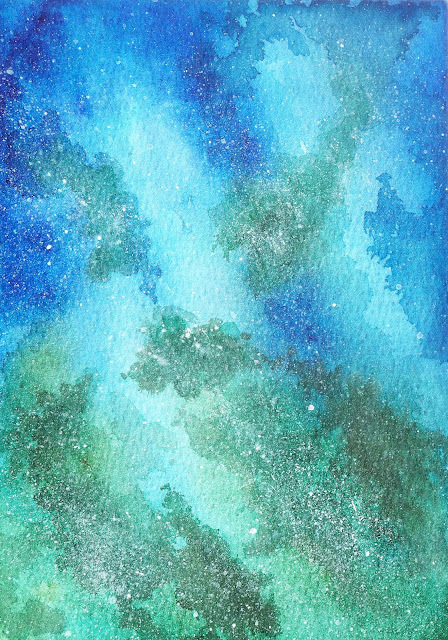 The second problem that bugs me is the arrangement of the celestial clouds on the green galaxy painting. While the shape and transition were natural in the former red galaxy painting, the latter looked a bit awkward, particularly the straight dark blue band going down. I liked the effect of the dried watercolor stains though.